Does this mean rappers Cardi B and Offset actually are back together? Following their high-profile split late last year, the on-and-off couple packed on some serious PDA at the 2019 Grammy Awards on Sunday, Feb. 10, 2019, E! News reports. According to the media outlet, Cardi B (real name Belcalis Almánzar) and her Migos rapper husband not only held hands while walking the red carpet in a rare joint appearance, but also "put their tongues together" during a photo-op. However, the married pair's apparent reunion wasn't the only reason the "I Like It" rapper made headlines before the award show. Ultimately, it was her pink-and-black mermaid-inspired gown from the Thierry Mulger 1995 Fall Couture collection that had social media users talking (via Vogue's Instagram account). Featuring a pearl crown and necklace, as well as a shell-inspired design, the instantly iconic look drew comparisons to various ocean-inspired pop culture references. "Bring back @spongebobbway so @iamcardib can play Pearl," Vulture's Twitter account read, while another person tweeted, "Cardi b looking like ursula from under the sea journey of the little mermaid." As Nicki Swift previously reported, Cardi B, 26, and Offset, 27, called it quits in early December 2018 after one year of marriage. The celeb pairing, who welcomed daughter Kulture Kiari Cephus last July, had secretly tied the knot in the fall of 2017. 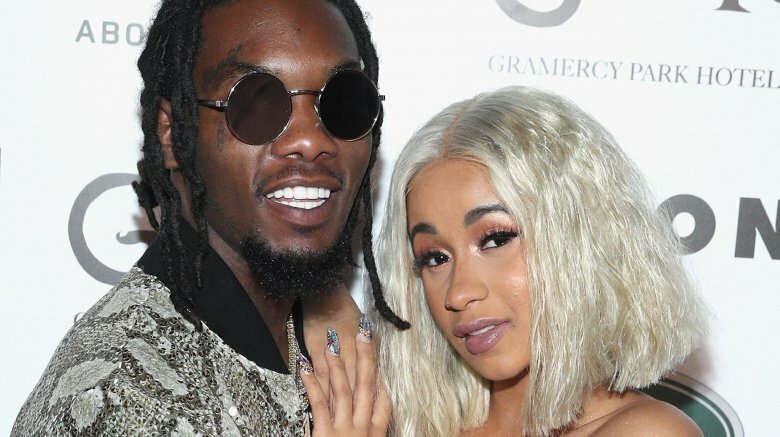 "Things just haven't been working out between us for a long time and it's nobody's fault," Cardi B initially told her Instagram followers, shortly before Offset (real name Kiari Kendrell Cephus) was hit with a round of cheating rumors. She added, "I guess we grew out of love, but we're not together anymore." In late January 2019, rumors that the two had allegedly reconciled their relationship at their shared home in Atlanta, Ga. surfaced. For her part, the "Be Careful" artist denied the reports in a since-deleted tweet (via People). However, Cardi B later told the magazine ahead of Super Bowl LIII, "I hang out with him, I talk to him every day and we do our thing. It's just like — to make things perfect…it takes time." She added, "And it's a marriage and there's a child involved and family involved." Back at the 2019 Grammys, Cardi B not only performed "Money" during the live event (via Entertainment Tonight), she's also up for an impressive five awards. Hosted by singer-songwriter Alicia Keys, the 61st Annual Grammy Awards are airing live from the Staples Center in Los Angeles on CBS.